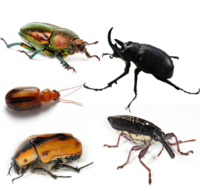 Ceaferas (ēac hātaþ bīetlas; heora hādes ƿitenacræftiȝ nama is Coleoptera) sind hād sceancƿyrma. Þǣr sind mā ƿiht þæs ceafera hādes þonne þǣr sind on ǣnȝum ōðrum hāde, and hīe sind mā þonne fēorðe dǣl eallra ȝecūðra ƿihta. Nēan 40 hundtēontiȝoðena eallra sceancƿyrma sind ceaferas (þæt is, nēan 400,000 ȝecynda). Sēo mǣste cnēoris on ƿitenacræftiȝre endebyrdunȝe ēac lōcaþ þissum hāde (þe is þā ƿifelas). Hīe sind sƿīðe missenlīce, ac hit is heora ȝeƿuna tō hæbbenne hardne ȳttram bānlocan and hard fōrefiðeru. Man nīwanost wende þisne tramet on þǣre 11:54 tīde þæs 11 Winterfylleþ 2015.